Eek! An alien has overtaken my computer this morning. I have written the blog a few times now and it disappears into computer land just as I finish. I will try again. 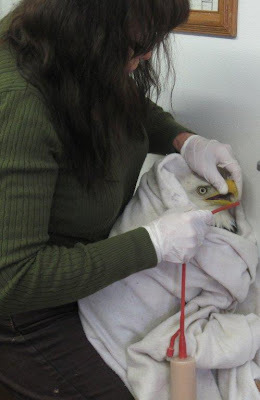 The Bald Eagle that was hit by a truck on Valentines Day is improving. He had such severe injuries including internal bleeding I was not sure what his future held. He started to improve and then we noticed he had some neurological signs. We did some blood work and guess what? He has lead poisoning in addition to his injuries. We started him on Ca EDTA injections right away. It has been five days since the shots were started and he is is doing much better now. Lead poisoning is such a terrible thing and sneaky too. 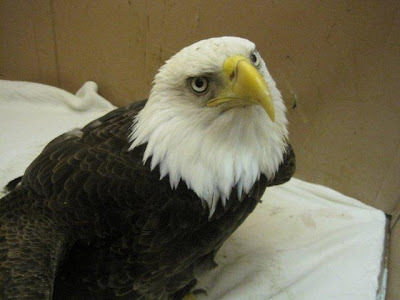 He is an adult Bald Eagle that should be out there getting ready for breeding, and instead he is at REGI fighting to survive. He was not able to see, taste or smell the lead ( Most birds have no sense of smell. ) in what was likely a deer carcass he was feeding on, but still it would have killed him had he not come into rehabilitation. You might wonder how he was hit by a car in the first place and what the chances were he had this kind of double trouble. 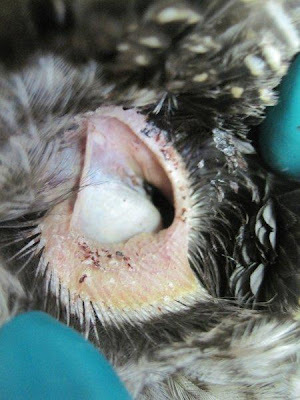 Lead poisoning makes a bird disoriented in the early stages. When he was admitted, the lead poisoning had not reached the point where he was starving yet. Since he was in normal weight, we didn't suspect it right away until the neuro signs began. The scenario may have been that he was disoriented and unable to get out of the way of the truck that hit him. It happens more than you imagine. 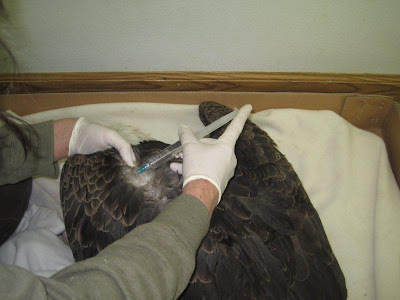 Sad that we humans still allow lead, a known toxin, to be used so casually in our sporting world. I wish people could see it the way I do. 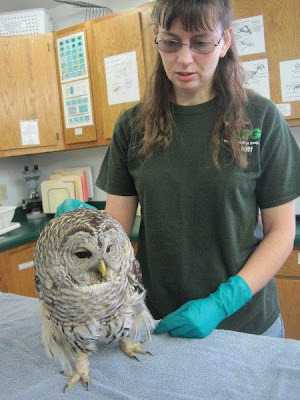 The Barred Owl from Mosinee is improving. He is flying and eating on his own, but we are keeping him confined due to the skull fracture from which he is still recovering. A new intern started yesterday for the spring term. She is a terrific young woman, and we are excited to have her as part of the REGI team. I will have some photos soon. We have been able to move some patients outdoors as the weather has been mild. ( Mild for Wisconsin anyhow.) 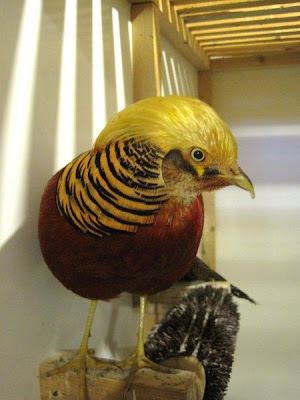 The Golden Pheasant that came to REGI just before New Years Day was one of the birds that is now outdoors. He is doing great but spring is livening up his hormones. He would like a lady love to share his joy with. The Male Ring-necked Pheasant admitted in December with restraints on his legs and his wings and tail feathers clipped, :( is also excited that spring is approaching. He would like a few ladies too in case anyone out there has some female ring-necked or golden pheasants. We are working on getting the spring newsletter together. We hope to go to press next week. I am preparing to head south, along with Education Director Steve Fisher and his wife Evie, to Houston, MN and the International Owl Festival this weekend. I hope some of you can join us there. I am doing the keynote speech on Saturday night at the banquet. It would be fun to see you there. We have a busy day ahead of us! Have a great day everyone!